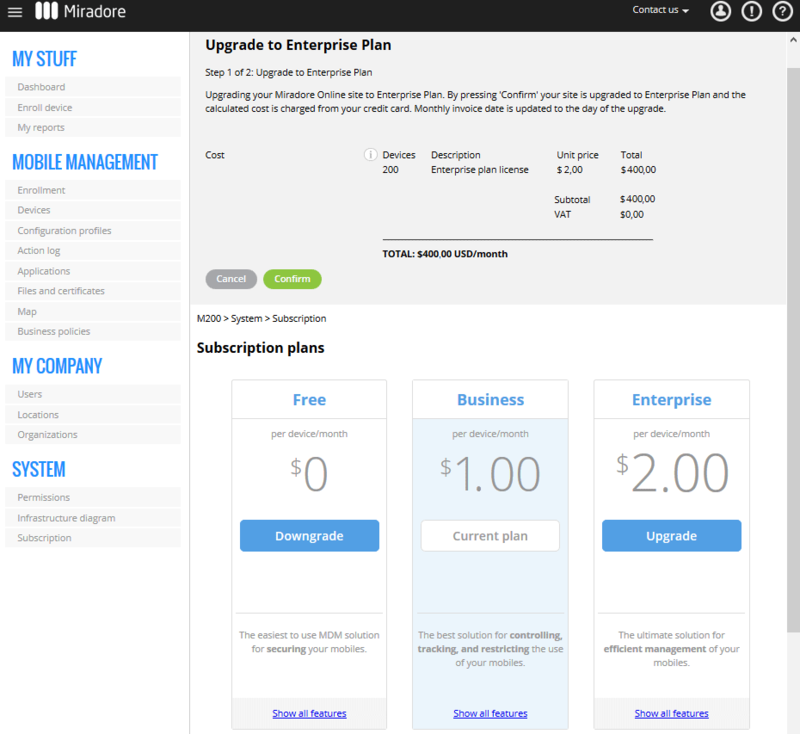 This article describes how to upgrade your Miradore Online subscription. See the Plans and pricing article for the differences in subscription plans. Most of Miradore Online features are free but there are some features that require a paid subscription. The features that are not available in the current plan are usually marked in grey in the user interface. The following instructions cover credit card payments. We also offer an invoice option. See About payment methods for more information. 1. From the main dashboard, simply click the Upgrade Your Subscription button found under the System menu on the left-hand side. This navigates you to a page where you can manage your site subscription. 2. 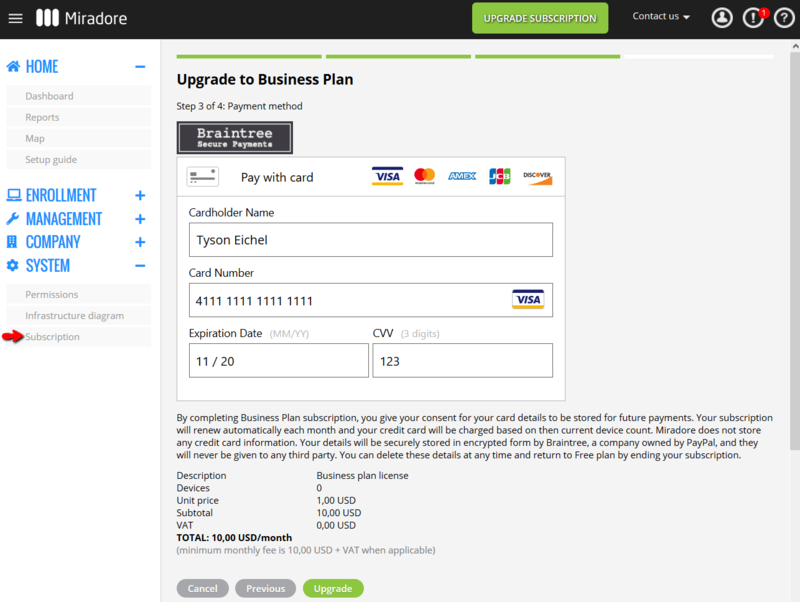 Choose desired subscription plan and click Upgrade to start the upgrade wizard. Fill in your company details and click Next. If you have a purchase order number that should be shown in the invoice, you can fill it in here. The VAT (Value Added Tax) number is required for countries of the European Union but VAT is only collected from Finnish companies. If the company resides outside the European Union, the VAT number is optional. If entered, it will be included in the invoice. 3. Enter the details for the billing contact and click Next. Monthly invoices will be sent to the configured address. Use the international format in the phone number field. 4. Finally, enter the credit card details. On this page, you will see the amount of the first invoice. It will be charged immediately. The subscription is renewed automatically and the fee will be charged on the same day each month, according to the then current device count. Note that the minimum monthly fee is $10 USD. See About payment methods for more information. You can change the payment details later, see the instructions for further information. Click Upgrade to upgrade your subscription. 5. After successfully upgrading, you will receive a confirmation as shown below. You will also receive the confirmation by email. In addition, a PDF document of the invoice will be sent to the defined billing contact email address. After a successful upgrade, you can see all your subscription details on the Subscription page. You can also See more details. 1. Navigate to System > Subscription where you can see the current details of your subscription, and click Change button on the right side of Current plan information or Change subscription from the page action menu. This navigates you to a page where you can manage your site subscription. 2. Select the Enterprise Plan, click Upgrade and follow the wizard instructions. 3. Press Confirm to apply the upgrade. Note that the Enterprise Plan features are available immediately and the calculated cost is charged from your credit card. The invoice is sent to the previously configured billing contact. Your monthly invoice date is updated to the date of the upgrade.